Residents of the northern area of Los Angeles County found themselves under rocket bombardment yesterday afternoon when two Air Force F-89 Scorpion jets fired a total of 208 Tiny Tim rockets at an F-6F Hellcat drone plane flying out of control at 30,000 feet. Miraculously, no one was injured as the rockets plowed into the earth over a wide area in the Palmdale, Newhall, Saugus vicinity. The drone crashed and burned east of Palmdale in open country. Three good-sized fired and numerous smaller blazes were started in the area at the same time, apparently by the rockets. A fire in Placerita Canyon burned over 75 to 100 acres before being brought under control. Another was seven miles north of Castaic on the old Ridge Route and burned over 50 to 75 acres before being brought under control late in the afternoon. The third and largest blaze was in Sold Canyon [cq; 34.366568, -118.255443], west of Mt. Gleason. At sundown it had burned over 300 acres of heavy brush and earliest estimate for bringing it under control was 10 a.m. this morning. The Forest Service had 350 men, four tractors, 15 tankers and two helicopters at work on the Sold Canyon fire. Ranger Bill Dresser was in charge of the units. Several oil sumps caught fire in the Newhall blaze and complicated the work of fire fighters. More than 200 men were at work on fire lines in the area under Asst. Chief Harvey T. Anderson of the County Fire Department. Anderson used 16 engine companies, five patrols, six camp crews and two tractors. The Saugus fire was being battled by Forest Service men under Ranger Lee Berryman and county units under Asst. Chief J.D. Barton. There were more than 100 men, a tractor, 12 tankers and a helicopter assisting in the battle. A threatened disaster was averted when crews managed to head off one blaze which had burned to within 100 yards of the Bermite Powder Co. plant. Navy officials said the F6F Hellcat, an obsolete World War II fighter plane built by Grumman Aircraft, took off from the Point Mugu Naval Air Missile Test Center at 11:34 a.m. on a regular missile test. The radio-controlled planes normally are routed seaward to the missile test range stretching to sea from Point Mugu. Ground radios control the planes until they are into the air, when a "mother plane" takes over. But as the plane reached for the sky, it went out of control and spiraled and headed southwest toward Los Angeles. Navy officials sent an alert. At Oxnard Air Force Base two Northrup F-89Ds on the ready line were "scrambled" on an intercept mission. The planes were piloted by 1st Lts. Hans Einstein of New York and Richard Hurliman of Des Moines. 1st Lt. C.D. Murray of Miami was Einstein’s radar observer. 1st Lt. Walter Hale of Houston was with Hurliman. The uncontrolled jet, trailed by the two jets, circled from northeast to southwest across Los Angeles at 30,000 feet, then headed northwest again while the two interceptor pilots waited for the craft to reach and uninhabited area where they could shoot it down. The drone circled Santa Paula and cruised over the Mt. Frazier district in the northeast corner of Ventura County. As the unmanned plane flew across the mountain area near Castaic, the interceptor pilots got their first chance to shoot at it. The two planes each made three passes, firing their total of 208 rockets, but neither pilot reported a direct hit. The drone crashed a few minutes later in a field between 110th and 120th Sts. East near Ave. P east of Palmdale. It was destroyed. By nightfall 13 rockets had been found and were under guard until a team of demolition experts from Edwards Air Force Base could arrive to handle them. It was believed that many more of the 208 rockets are scattered over the hillsides and canyons of the area and all persons were warned not to handle them but to call the nearest Air Force or Navy installation immediately. Air Force officials in Los Angeles said the rockets arm themselves after being fired and disarm themselves, if they miss their target, when their speed decreases below a certain point. Several persons in the area of the bombardment had narrow escapes from injury when shrapnel from the missiles sprayed the vicinity where each landed. J.R. Hingle of 38559 4th St. East, Palmdale, said pieces of metal went through his garage and home, nearly hitting Mrs. Lilly Willingham who was sitting in the house. Mrs. Edna Carlson of 38402 3rd St. East, Palmdale, said a chunk of shrapnel went through her front window, bounced off the ceiling, went through a wall and wound up in a pantry cupboard. Her 6-year-old son William was in the house with her at the time. Larry Kempton, 17, and his mother, Mrs. Bernice Kempton, of Leona Valley, were driving west on Palmdale Blvd. when a rocket struck in the pavement just in front of their car. The flying fragments broke the windshield, tore a hole in the hood, blew out the left front tire and punctured the radiator. There were 15 holes in the body of the car and two in the windshield. Neither the mother nor son was injured. Mrs. H.E. 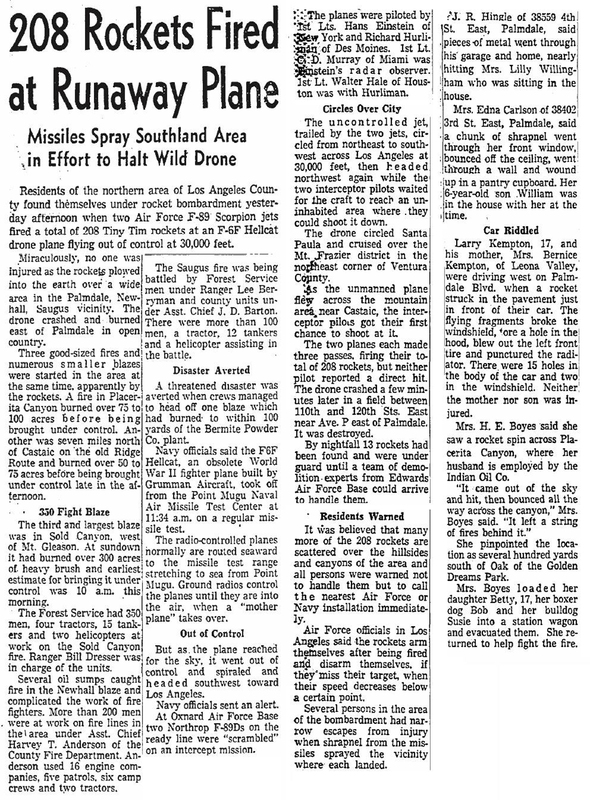 Boyes said she saw a rocket spin across Placerita Canyon, where her husband is employed by the Indian Oil Co.
"It came out of the sky and hit, then bounced all the way across the canyon," Mrs. Boyes said. "It left a string of fires behind it." She pointed the location as several hundred yards south of the Oak of the Golden Dreams Park [sic]. Mrs. Boyes loaded her daughter Betty, 17, her boxer dog Bob and her bulldog Susie into a station wagon and evacuated them. She returned to help fight the fire.